SendHub is a flexible and powerful SMS solution and all around business phone system for many industries, and one niche that we are cozying up to is transportation, dispatch and delivery. App-based services like Lyft and others are using SendHub to manage thousands of drivers across the country each day, and other shipping and transport companies are finding their own custom workflow through our fully integrated system. Today, many dispatch teams work from one centralized location while managing drivers in multiple cities. SendHub’s easy SMS solution connects all modes of communication in one place to provide transport companies with several key benefits. Leading dispatch companies will tell you that business-class texting has become the preferred mode of communication for drivers. More and more, customers are also coming to expect SMS service support right through their smartphones. Whether your fleet consists of private cars, delivery personnel or transport drivers, all oversight probably comes from one centralized office. Voice calling and emailing are cumbersome modes of communication between dispatchers and drivers – and traditional VoIP business phones require costly and complicated setups. SendHub is a hardware-free solution that works with your team’s existing phones and computers to funnel all work-related correspondence through one system. This technology allows one dispatcher to manage more drivers at once, all while creating a trail of communication that can easily be searched and reported on. Though today’s drivers are just as likely to be delayed by traffic or other unforeseen circumstances, customers are coming to expect faster and more punctual service. This makes strong communication between drivers, centralized support agents and customers a key factor for any company’s success. SendHub offers efficient, clear correspondence to keep drivers moving and to manage customer expectations on the fly. Transportation provider Ace Limousine and shipping service Conveyabull are examples of how modern dispatch companies are taking advantage of SendHub’s unified system for all communication. Professional voice calls, voicemail, conference calls, chat, file sharing and mobile SMS are all connected through one easy-to-use interface that is now accessible via mobile or web. Washio, a dry cleaning and laundry service delivered to your door, reported that its entire dispatch support team was up and running with SendHub just minutes after signing up. Now dispatch agents have the tools to send company-wide bulk messages and one-to-one driver texts instantaneously. Drivers also take advantage of the two-way messaging to update support agents on delivery status and special customer requests. Transport companies like STAT Emergency Medical Service, Eco Elite Limousine and more have seen measurable advantages through SendHub’s all-in-one mobile phone system. 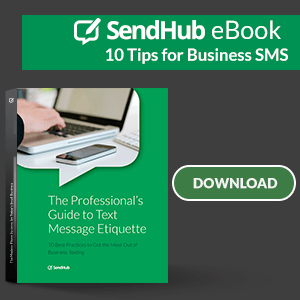 SendHub helps transportation, dispatch and delivery companies to manage hundreds of thousands of business text messages each day. Customers can now contact support via voice call, chat or text message – and centralized support teams gain instant access to driver records for resolving customer concerns. Convenient and professional SMS online messaging helps dispatchers bring together teams of hundreds of drivers, creating a more cohesive mobile workforce and ultimately increasing customer satisfaction. 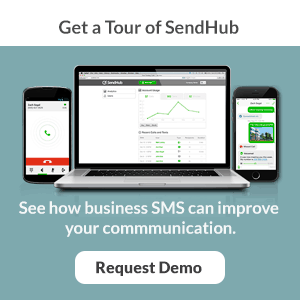 If you’re interested i learning what SendHub’s Business text messaging can do for you. visit our brand new Business SMS page to learn more, explore use cases or request a personalized demo.